Depending on how this all plays out, National could be a very lonely party on the opposition benches after the next election. Even with the faux support of other centre right parties, the Natz are unlikely to win the next election. It may be a forgone conclusion that either John Banks or Peter Dunne are removed from Parliament before the next election, as they both face serious charges which if upheld would ensure their political careers are effectively over. As I’m sure the enlightened reader’s of The Daily Blog are aware, Banks is caught up in a private prosecution concerning his not so anonymous donations while Dunne is facing accusations of leaking a report into the GCSB. If found guilty, both these mealy-mouthed politicians should be automatically expelled from Parliament, being that the respective crimes they’re accused of carry a maximum penalty of two or more years in prison. With the government having a one-seat majority, losing Banks or Dunne could cause a snap election. Whatever the outcome, the writing is already on the wall for United Future. Last week the Electoral Commission deregistered the defunct party because it basically didn’t have enough paid up members. David Carter, the biased Speaker of the House, hasn’t decided whether Dunne should lose his extra $122,000 per year in party funding, which in my opinion is an entirely unacceptable decision to delay making. This is public money after all and there are rules that should be followed. The Act party is in a similar boat and polling well below the threshold required under MMP. It’s yet to be seen whether another National party endorsement will get Banks reelected in Epsom and with the Act party registering well below 1%, their hopes of remaining a viable political party look set to be dashed against the rocks of democracy. Depending on how this all plays out, National could be a very lonely party on the opposition benches after the next election. Even with the faux support of other centre right parties, the Natz are unlikely to win the next election. NZ First and the Maori party will both align with a Labour and Greens coalition government, given half a chance. The problem for Peters is NZ First’s undignified racist attitude, which has received widespread condemnation both here and abroad. Such divisive sentiments simply aren’t resonating with the general public like they used to and NZ First’s support will probably decline into oblivion if they continue to follow a similar political tactic. They’re also not polling above the threshold to retain any list MPs, which means John Keys’ changing of tune to entertain the idea of a coalition deal with Winston Peters could all be in vain. The issue here is that a majority of the voting public is fed up with right wing policies that have allowed New Zealand’s economy and society in general to stagnate. We used to be one of the best countries in the world, now we’re lucky to even rate above average. Only a new policy direction will give all Kiwis, irrespective of skin colour or financial status, the chance to attain a better standard of living. Only a change of government will ensure we all have the brighter future that was promised to us by John Key all those years ago. I sincerely hope that the Nats will have a very lonely time in opposition. But to think that Winston will save the day for Labour if NZ First gets enough votes to hold the balance of power is delusional. NZ First represents a section of NZ which would be happy in the National Party. What holds them back is the Nats love affair with the Chicago School of Economics. Never underestimate Winston’s ability to tap into a vein of populism.(populism?) And never underestimate the latent racism that lies beneath the veneer of polite society. It would be nice to think that Winston’s views no longer resonate, but I am not sure its true. Nevertheless, he seems to be a cyclical MP. He gets in to Parliament, blows it somehow (eg the “NO” sign) and gets dumped, re-emerges next election…. so if people are tiring of him it is because he stands for nothing except what is convenient…. which ironically, somehow works for him. Don’t underestimate him. Hope that quote worked. Agree with the general theme of the article Jackal, not some of the specifics however. You say NZ first are not polling above the threshold, however minor parties tend to do better at election than polls generally, eg. greens/nz first/conservatives. As Kingi says above, I think NZfirst may have a part to play in this next election. Re: your comment above about the change of government, imho with Nats for last 5 years, and labour for 9 before that, neither of these are going to give you a new policy direction in NZ. It will be up to the minor parties and their highest priority policy for which they will give support to government that has any show of changing the direction of our major parties. I’m not sure whether The Jackal is being optimistic or naive. NZ First and the Maori party will both align with a Labour and Greens coalition government, given half a chance. NZ First and the Maori Party are both better fits with National than with Labour/Greens. I’ll grant that they could throw in their lot with them out of sheer realpolitik, but they differ quite fundamentally on ideology and several policy points. Enough of the old Labour guard are still around that there may be lingering animosity between the Maori and Labour parties. Also, never, ever write off Winston. People keep on calling him irrelevant, saying he won’t be back, and yet here he is, like an implacable Michael Myers of NZ politics, unstoppable and inevitable. He is a master of the game, and to suggest otherwise is doing him a disservice. Also also, why can’t ACT just nominate a different popular puppet for their pet fiefdom of Epsom? Banks is irrelevant, the real power in ACT is conent to operate behind the scenes. If you think Banks negotiated any of the coalition agreement that has forced Charter Schools on us, you’d be sadly mistaken. Far from being “naive”, I think Jackal is positing various outcomes. NZ First and the Maori Party are both better fits with National than with Labour/Greens. Perhaps. But Winston has also been in coalition with Labour. So really, only Winston knows what Winston will do. NZ First is a wild card. If they can be predicted to do anything, it’s to do the opposite of what everyone expects them to do. 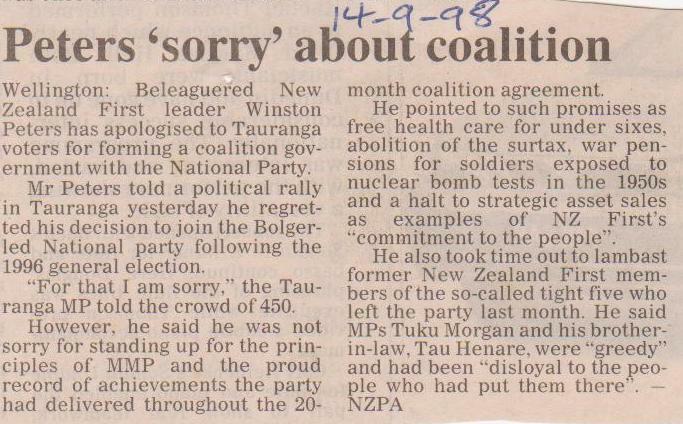 In 1996 I remember people voting NZ First on the expectation that it was a vote for a Labour government, combined with a warning to Labour not to repeat the late 1980s. Epic fail. In 2006, National supporters voted NZ First on a similar basis, and were horrified when they propped up Labour for one more term instead. If people genuinely support NZ First policies (whatever they are), they should vote for them. After all the whole point of MMP is that we can vote for the party which actually reflects our views, rather than the lesser or two evils. But voting for them on the assumption that it will deliver either a National-led or Labour-led government is a mug’s game. Peter Dunne announced his resignation as a Minister, at 4.05pm today. The National-led guvmint just got shakier. No doubt Key is relaxed.